Eutechs PCTestr 35 is a handy device for measuring pH, conductivity and temperature, it has a one press parameter toggle which switches parameters at the press of a button. It is user friendly; featuring a scroll menu with four buttons for stress free navigation, up to 5 point pH calibration and 3 point conductivity calibration with the choice of ATC or MTC and adjustable temperature coefficient (0.0 to 0.0%). The temperature sensor is housed within a unique dome-shaped casing for faster ATC response and faster measurements. This is the longest lasting tester in the market, when a sensor needs replacing it is a simple procedure requiring no tools. 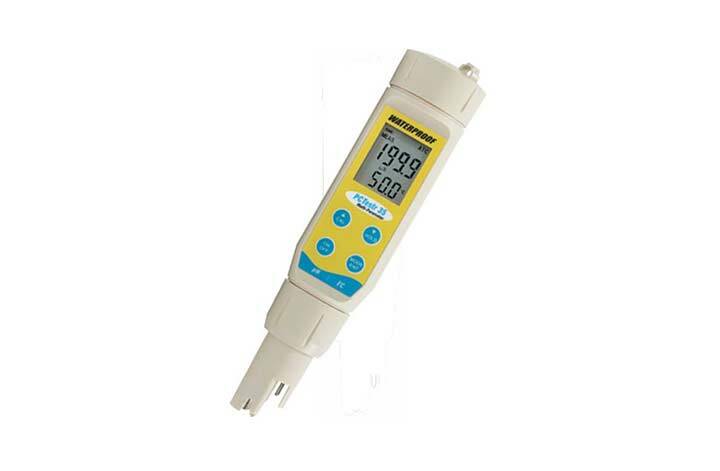 Certified IP67 waterproof this lightweight tester floats for easy retrieval if it is dropped in water, and also comes complete with a 2 year meter warranty.